Monday Night Minis is back and this time with a new venue, eager and enthusiastic host, and a full-on facility! I've spoken with Alan, the owner of the new Speedsportztrack in New Cane, and we've decided to host MNM at his facilitywhich he has offered us free roam to (within reasonable behavioral expectations). For now, we are expecting to run the rental (.5mi) and GP track (.8mi) with access to the air-conditioned facility with bathrooms, large meeting/dining area, paved (rantal/south) and gravel (GP/north) lots, and viewing/party balcony! As the numbers get thicker and the nights get longer, expect more fun and possibilities like catered dinners, cone racing, stunt arenas, fiddy soccer, and general mini mayhem! This can get as big as we want, or stay as small as we like but the results will come from the numbers. We've already had our first event on May 1st and the turnout was enough to convince Alan that it was worth doing, even with minimal advertising and promoting. Monday Night Minis #2 is scheduled for May 15th so mark your calendars and get your bikes and cameras ready because we've extended the hours and will be riding into the night. That's right, folks, minibike track time on a brand new course just outside of Houston UNDER THE LIGHTS AND INTO THE NIGHT! This time we'll be running the big .8 mile track for the full event. This is the track we're hoping to add to the TMGP circuit for next season, so come get your practice in! Registration at the desk is $50. Spectators, and children are FREE! Full safety gear is required: 1 or 2 piece leather suit, gloves, boots, and helmet. Run what you brung up to 155cc/85cc. No knobbies, no leaky bikes, no horseplay, NO SPORTBIKES. *side note for you sumo guys, 200cc/125cc2T and up: you'll be welcome to come out and play if you can get at least 2 or 3 of ya suited up and paid. Although we likely won't run minis at the same time as big bikes, everything is up for consideration and we'll even divide up the sessions with breaks if we have to. MESSAGE ME OR CALL THE SPEEDAPORTZ DESK IF YOU HAVE ANY QUESTIONS! Last edited by FoxRider; 05-08-2017 at 12:39 PM. PS. The video exhibits the rental .5 mile track. the GP track is wayyy faster. Leathers are required to get on the track, not on the property. Although I'll never understand the lot stunter crowd, arrangements can be made to cone off a section to have yall play in if enough of ya come out. Are you saying that the parking lot can be conned off so people can do stunts? Or to make a track with cones in the parking lot so those without leathers can run their mini's? If it were my call I would say racing will only be allowed on the track. It's not my property, I am just the organizer, so Alan has the final say - although I'm sure he'll have similar input. Just the notion of stunting in the lot will still be a bit dicey until both lots are paved. Currently, the GP track/ north lot is still gravel. We are expecting to park in the gravel and enter the GP track from the north entrance, and leave the south entrance for visitors and kids/newbies who need practice on the rental .5mi track. To clarify, the whole facility has the space and amenities to allow this to grow into a huge event twice a month but for now, things are still getting ironed out not only with planning but also the construction. Alright, lets get some Motards out there on Monday. I'm taking the minis and will bring the KTM if we can get some others on motards out there. Post in the Event thread I created and get a count of how many yall will bring so we can plan ahead if needed. The same rules apply - full leathers and gear required to ride the track, and no knobbies. The final layer of track surface is being prepped for install and so for the month of July we will not be riding on the big track. Alan and I both have busy schedules this weekend so we are taking off for the first Monday of this month but he did say we are welcome to come run the .6mi rental course on the third Monday if we still Want to get our fix. July 17th is doable but only on the .6mi track. Anybody going to Monday night mini tomorrow? A buddy and I will be there on our Zs. I'll bring the jacket liner. I spoke with Alan while checking out the progress on the final surface for the GP track and we're going to be implementing some new tech requirements for minis and karts to enter the track and will be inspectes before allowing access. - safetywired fill and drain plugs for oil and coolant. - catch cans for crankcase breather, carb overflow, and any other breather/vent/drain hoses if they are not circulated back into ansealed intake. These points were made clear after a walk around and coincidentally while also a factory Grom was riding the short track and scraping the kickstand on the corners right next to us. We both understand this will decrease the attendance short-term. I plan to do a little research and create or link to a write up for slider installs, and other items addressed. The next MNM is in 18 days so talk with your racer buddies and get to wrenching! Badoop Badoop Badoop Badoop. 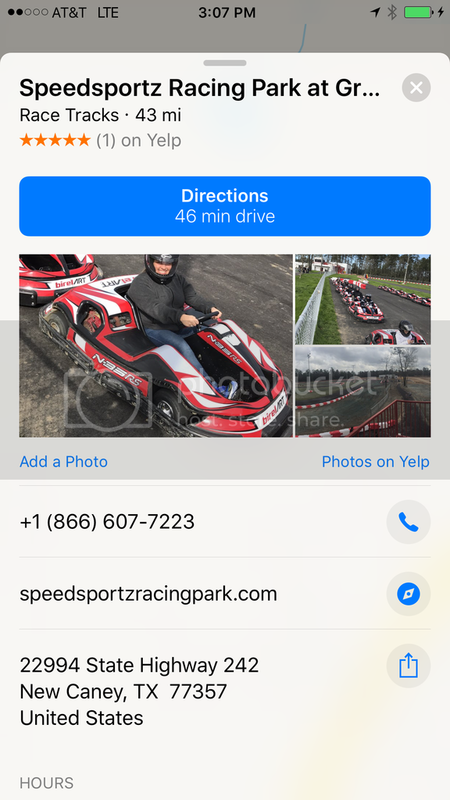 *News flash* I just got off the phone with Speedsportz owner and due to the apparent difficulties many riders are having with complying to the slider tech requirements, Alan will not turn anyone away for not having them and would rather see us come ride than be held back by tech rules. However, he did say he would like for us to eventually have some sort of soft-edged devices at the corners of our bikes to protect his brand new track in the event of a crash. Not very many as the track only opened it's doors this Spring and just yesterday announced the GP track has had it's final surface layer cured and is ready for full time use. so I am the only one here right now.